The Talmud says (Rosh HaShana 17) that anyone who swallows their pride will be forgiven for all their sins! Rashi explains that if you let someone be right even if they’re wrong, G-d will forgive you even if you’re wrong. We all sin. How do we feel after we have done something that we shouldn’t have? Do we rationalize and try to make ourselves feel better? The Talmud says (Brachos 12) if one sins and then is ashamed of what they did (boshet) that sin is forgiven! If you answer Yehai shmay Rabba with all your strength any evil decree will be annulled. (Shabbos 119) If the Yehai shmay Rabba is said at the Kadish following Torah study than all sins are forgiven. (Koheles Rabba 9) If you tell G-d what you feel about him at a well placed moment and you really mean it your relationship has been restored. “With kindness and truth sins are forgiven” (Mishlei 15; 6) ‘Truth’ refers to the study of Torah (Brachos 5) There is no better way to strengthen our relationship with Hashem than by studying His Torah daily. Even just a commitment to study a bit more works. A day should not go by that every one of us doesn’t take at least a few minutes to study a bit of Torah. Rabbi Yaacov Haber, Shlit’a, “builds” Creation according to its two main characteristics, Justice and Mercy. Everything that HaKadosh Boruch Hu created was for the sake of the essence of Shabbos which is the essence of the Jew. Thus, the cycle of Creation revolves around how the Jewish People inhale and exhale Shabbos. It should be “lived,” according to the Rav, who cites from Rav Tzadok HaKohein, in Oneg (joy/pleasure/delight)! The Jewish People are the “switch” that keeps the flow of Creation cycling ever higher. In light of the recent troubling events and tensions in Beit Shemesh, and the terrible Chillul Hashem that has resulted, Rabbi Yaacov Haber, Rav of Kehillas Shivtei Yeshurun in RBS-A, invites all concerned parties, men and women, to a town hall meeting. The meeting is intended to produce constructive and positive strategies to deal with the situation. Maariv will follow at 20:30, followed by regular Night Kollel program learning Hilchos Tefillin, at 20.45. I had the privilege of attending a “Town Hall Meeting” arranged by Rabbi Yaacov Haber last week, at his Kehilas Shivtei Yeshurun (KSY) shul in Ramat Beit Shemesh. The rav introduced the event by observing that there had been a huge Chilul Hashem around the world, centered on the recent events in Beit Shemesh. The purpose of the evening was to have a forum, for all present to float ideas which would (or could) create a Kiddush Hashem. Rules: one minute on the timer for each speaker; any negativity is forbidden and will be stopped in its tracks. On with the show…! Out of around a hundred people who attended, over twenty people chose to speak. The attendees were all anglos, and included broad representation of dati leumi and Chareidi people. Men/Women were approximately 50/50. There were also some individuals from Givat Sharett, including those who have been directly involved in the struggle there, such as Dov Krulwich and Daniel Goldman. In spite of the controversial and highly charged events in recent weeks, I do not recall even a single “negative” remark in the one hour event. The time keeping was rigorously enforced, by the all-smiling MC David Geffen, and so everyone had an opportunity to speak on an equal footing. * Keep back tzedaka money for individuals and institutions in BET until Anti-Violence conditions are met. * Produce PR, explanatory and family videos for Youtube etc. * Daf Shalom – something like daf yomi that the community does each day for shalom. Indeed, as I drove away from the KSY shul, in order to do some errands in Beit Shemesh, I passed dozens of RBS Bet residents, crowding around an incident involving a bus, and a large dumpster. I believe protesters had thrown stones at the bus and tried to block the main road with the dumpster. For a blessed hour, perhaps we had experienced the eerie quiet and peacefulness of the eye of the storm. I do hope that some of the ideas will spawn practical projects, as the need for “Beit Shemesh” to have positive associations tomorrow, instead of the negative ones today, is a supremely important mission. However, as Rav Haber said (I paraphrase): if the only thing to come out of this evening, is this evening, and Hashem delights in our efforts to bring about a Kiddush Hashem, then this has been worthwhile. A turqousie blue (like Heaven) wrist band / car flag/ T-shirt or bumper sticker In Hebrew and English I love my fellow Jew The torah on one foot J.B.
Professional video highlighting the kiddush Hashem of chareidim R.K.
Have different Kehillas invite other Kehillas for kiddishes R.K. Animated videos explaining certain chareidi positions R.K.
Have a site where we post video stories from charedi families R.K.
A story book for kids talking about different types of religious Jews R.K. Hire top of line PR firm to promote good stuff R.K. The Daf Shalom- Let the Torah’s light dispel the darkness of machlokes and Chilul Hashem Method: People learning a daily halocha or hashkofa from a common Sefer with the Kavonna for bringing Shalom to our city B.J. There was once (and maybe still is) a joint neshei from Sheinfeld & Gerrer Chasidim, I think from Bet. The idea should be replicated. M.T. Use our united pull as a group to try to get the Eida & other Ashkenazi rabbinic organizations to publicly, unequivocally condemn the violence that has been occurring in Bet. If certain leaders want to but can’t for some reason (just to speculate), pool our resources to pinpoint the problem and find a solution. M.T. To Publicize the words of the Netziv in the introductory to his commentary on the torah about the causes of Churban Habayis. S.W. To facilitate exposure of the Dati Leumi Rabbis in Charedi Schools and vice versa via shuirim or discussion groups. S.W. To create An Ashkenazi Vaad HaRabbaim of RBS A ( to Start)including representative rabbis from all kehillas S.W. To Create A Sephardi and Yemenite Vaad S.W. Target the influential people! Find the one, two or three Jewish leaders that we have enough of a relationship to get a real open dialogue (not part of choir) and open a dialogue with them. Workshops and dialogue groups for children and adults with the aim of discovering the wonderful qualities of all the different groups of Am Yisrael. C.A.B. The “אני אוהב את כול יהודי” kippa in the ‘90s. Half is black velvet and half is kippa srugah, with those words written across. C.A.B. 1. We list the types of recent actions that we consider “abhorrent behavior”. 2. We ask that they join us in publicly denouncing this abhorrent behavior. 3. We ask that, as this behavior is a chilul Hashem and in most cases is, in any respect, punishable by the Beit Din in Olam Hazeh, that any known miscreant be first warned and then brought before the Beit Din and if convicted, then punished. 4. We ask that when sending mishulachim to Beit Shemesh, they provide a letter in English and in Hebrew clearly stating their position on this issue. 5. We inform them that we as a community and as individuals have taken on a decision to no longer give tzedaka, in a shul or at our door, without a valid letter from their Rav. S.B. Let’s be mekadesh Shem shomayim by tweeting and retweeting at least one story or link about amazing things we do everyday!! E.H. Educate people to search out and notice the positive sides of other people. L.A.
Do I Still Take Sugar? My Rosh Hashana experience this year was greatly enhanced by having Rabbi Yaacov Haber’s latest book at hand, The First Ten Days. The First Ten Days is a unique and beautiful book. Pockets sized, with striking graphics – the book is a compact combination of esoteric mysticism, with down-to-earth practical advice. Based upon the Zohar’s observation that the Ten Days of Repentance parallel the ten mystical sefirot, Rabbi Haber takes the reader through each Sefira/Day. Each Sefira/Day is covered in just four or five pages, including an eminently understandable description of the Sefira, its relationship to the Repentance Process, and a short To Do list for the reader to take immediate action and apply to his/her own life. Those familiar with leading self-help books, like Dale Carnegie’s How to Make Friends & Influence People and Steven Covey’s The Seven Habits of Highly Effective People, will particularly appreciate the 10-Step self-help value of Rabbi Haber’s book. The First Ten Days is also reminiscent of the writings of the late and great Rabbi Aryeh Kaplan who, like Rabbi Haber, succeeded in bringing the depths of mystical Jewish thought within the range and scope of both lay and (otherwise) erudite readers, simultaneously. The second day of Rosh Hashana (New Year), for example, has the attribute of the sefira Chochmah. Chochmah is explained as being the “first kernel of an idea that enters into the psyche.” Rabbi Haber encourages the reader to re-evaluate his/her chochmah – “re-examine the givens in your life”. Rabbi Haber takes the reader step-by-step, reaching the climax of Malchut (Majesty) on Yom Kippur itself. “With Malchut the creation of the world became complete”. In just eighty pages, including stunning illustrations and visually pleasing, clearly presented prose, Rabbi Haber covers the gamut of Jewish mysticism, the meaning behind the 10 Days of Repentance and provides a convenient pocket-sized book to accompany and guide our ideal, yet practical, spiritual growth between Rosh Hashana and Yom Kippur. 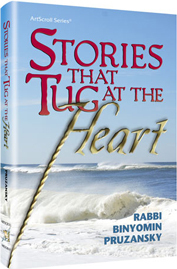 For those who are technologically up-to-it, Rabbi Haber’s book is available digitally. Pashkevil are protest posters that are plastered on walls. They are particularly common in Jerusalem as a means of conveying directives to the public. 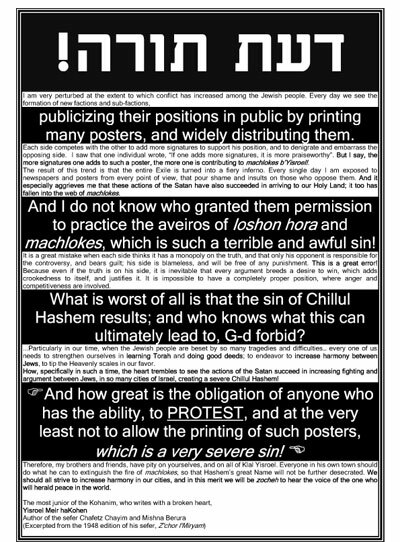 When I lived in Jerusalem, everyday there were posters about how, in the opinion of the poster maker, various rabbis, organizations or publications, created existential threats to the Jewish community. There are also pashkevil about the dangers of attending public concerts. (Jewish music performed by Orthodox men and children with separate seating); the dangers of cell phones that have Internet access; and the dangers of certain books that expose the community to foreign concepts. Now, I live in Ramat Beit Shemesh where new pashkevil were just plastered around the city regarding a new Yeshivah for boys, that in the opinion of the plasterer, does not conform to the ‘long standing’ traditions of Ramat Beit Shemesh. (Ramat Beit Shemesh was founded in 1998). Pashkevil’s are anonymous. Although they carry the signatures of great Rabbis, these signatures are dubious at best and have seldom been proven to be authentic. To my observation, they seldom accomplish anything positive, while they serve the purpose of promoting division and hate amongst Jews. So, with the help of my esteemed congregation, Kehilas Shivtei Yeshurun in Ramat Beit Shemesh, I designed a pashkevil of my own. The pashkevil is a verbatim letter of the Chofetz Chaim, signed by the Chofetz Chaim. We will cover every Pashkevil we can find with our pashkevil. This is the pashkevil to end all pashkevil! 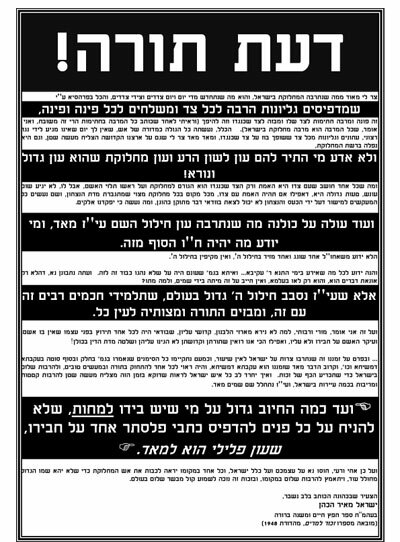 If you’d like to participate in our campaign or for your own copy of the “Chofetz Chaim Pashkevil” – please contact me. I remember as a child growing up in ‘anywhere USA’ meeting two shluchim of Torah U’mesorah. They had come to our town to talk to parents about sending their children to a Yeshivah. They were Yeshivah bochurim that had taken from their vacation time, packed their suitcases with cans of tuna fish and sardines and spent their nights on Greyhound busses to get from city to city. They had genuine warmth that was inspiring and their expectations were modest. They would spend hours talking to parents and if they could get ten families, just ten, they would begin to take steps to create a day school. Every Jewish child was a valuable diamond – no matter what the family’s politics or affiliation was. These men were heroes of Biblical magnitude and indeed they succeeded in creating a world of Torah in the USA. Similar phenomena took place in England, South Africa, Australia and of course in Israel. Organizations such as Chinuch Atzmai, Peeylim created a generation of Torah strength. Bou venachzik tov lahem for the hundreds of thousands of families that today lead a Torah life. In moments of despair I try to imagine to myself what would happen if our modern day heroes would reach the threshold of our Yeshivot presenting a precious neshama from out there. What would be the response? There has been a struggle in Jewish education that has been going on for millennia. On the one hand, it has become abundantly clear over the past few decades that the key to the survival of Judaism both in Eretz Yisroel and in the Golah lies in the formal Chinuch that we, our parents and grandparents have created. They came to this country or other countries during the immediate post war period with a mission. The mission was articulated by Gedolim, carried out by askanim and funded by ashirim. They and we succeeded in creating a renaissance in Torah values, halacha and Yiras Shamayim. But as Yeshivos began to become the norm in frum circles and the populations began to outgrow their facilities, criterion were created. Who exactly gets in? As the ‘system’ evolved and developed, niche and special needs Yeshivos were created to facilitate the outstanding students. As part of the general shtiebalization of Klal Yisroel, schools like shuls became the private domain and ownership of spiritual entrepreneurs who felt no obligation to make sure that every child has a Jewish education. They are right – these are private not community institutions. These Yeshivos saw and see it as their mandate to build a certain type of school and feel the need to protect the environment that they are working so hard to maintain. A child that comes from a family with an even slightly different approach or standard is rejected outright because the reputation of the Yeshivah may be compromised, the ‘better kids’ will look elsewhere and the students that are presently there may become negatively affected by the new child. As much as this scenario is distasteful and elitist, the menahalim and Roshei Yeshivah are within their rights. These are private enterprises, boutique institutions that have no obligation per se to accept every child. On the question of expelling a troublesome student from yeshiva, Rav Yitzchok Hutner is quoted as opining, “Even if I thought that tomorrow this student will leave the fold – if that student will be harming others by staying I would expel him…. We are not allowed to harm the others in order to save him.” The child and his or her family now have a serious problem. They must quickly scramble so the child does not end up on the street. It as if looking for a Country Club that will take them in and too often they end up with a compromised opportunity in Jewish education. There is a famous Talmudic story that perhaps changed the course of history. After the horrific destruction of Yerushalayim the Chachmei Yisroel moved to Ashdod and tried to rebuild some of that which had been lost. 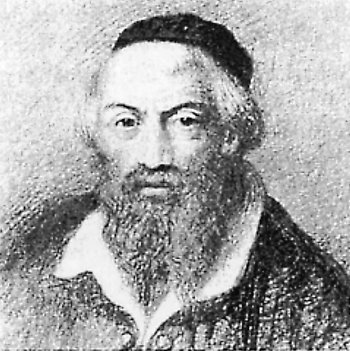 Rabban Gamliel, the grandson of Hillel and the Nasi Yisroel was an unforgiving governing figure of authority that presided over his Yeshiva with iron fists. He was protecting the integrity of Torah by expelling any student in question. He hired a guard to stand at the entrance way of the Yeshivah and not admit anyone that wasn’t “tocho k’baro”. I’m not sure where he found this guard that somehow had the ability to discern between men and giants – according to Reb Tzadok HaKohein it must have been a maalach! When his difficult and sometimes harsh rules became offensive and intolerable Rabban Gamliel was demoted and was replaced by Reb Eliezer ben Azariah and the shomer/maalach was removed. People came from everywhere to learn Torah and the Yeshivah became full. Rabban Gamliel watched this phenomenon and was moved to sadness. He sadly reacted and said, “I see that I have deprived the Jewish people of Torah!” While guarding it’s purity he felt no choice but to exercise rejection. As he saw the seven hundred new students march in to the Beis HaMedrash perhaps he remembered how his own grandfather Hillel was rejected from the Beis HaMedrash of Shmaya V’Avtalyon and sat on the snowy roof to hear words of Torah. In fact the issue itself was a machlokes between Beis Hillel and Beis Shamai regarding the propriety of setting yeshiva acceptance standards. The position of Beis Hillel was that anyone who wanted should be taught Torah, for it will ultimately restore them to a good path. The demotion of Rabban Gamliel and his apparent remorse created a paradigm shift for the Jewish people. Fast forward a couple of thousand years – Rav Aharon Kotler had also experienced a Churban. On the boat from Lithuania to the USA he was already conducting meetings about founding a Yeshivah that would produce serious Talmidei Chachomin, Gedolei Torah, that would sow the spiritual desert of America. He carefully chose his students and rejected almost everyone. He had 125 Talmidim. When he left this world his son Reb Shneur opened the doors to the Yeshivah which today serves close to six thousand Bnei Torah – who knows? The history begins with the well known Takana of Yehoshua ben Gamla. Yehoshua ben Gamla was a Kohein Gadol during the Chashmonaen era. As the leader of the community he realized the disaster which was developing from the inability of fathers to link their sons to the Mesorah. He saw that although there is a biblical mitzvah for every father to educate their children due to travel and parnasah issues it simply wasn’t happening. Yehoshua enacted an innovation which was revolutionary at the time – he established a school system - predating the public school system by about 1900 years. The Chachmei Yisroel supported him on this initiative and it became a Takana for all future generations. Rav, the great Rosh Yeshivah of Sura and Gadol Hador told us to, “Remember Yehoshua ben Gamla for good, for had it not been for him, Torah would have been forgotten from Israel.” The Rambam writes that since the enactment of the Takanah of Yehoshua ben Gamla there is an obligation on every community to build and support a school in their community where every child can learn Torah. The Aruch HaShulchan comments that the Chachamim realized that although the innovation came about because of a negative situation it was indeed an eternal improvement and made the takana a permanent obligation on Jewish communities. A fascinating Halachic insight is stated by Rebbe Tzvi Elimelech Shapiro ((Bnei Yissoschor) . Although the original Mitzvoh of Talmud Torah was to teach your children or to pay someone to teach your children; “V’Shinantom L’Vanecho”, once the Takana of Yehoshua ben Gamla was enacted the chiyuv itself transformed into an obligation to create a community school where all children can (and must) attend; if need be – without tuition. Therefore, the Bnei Yissoschor posits, if a community member does not participate in the creation of this school, not only is he falling short on his community obligation but indeed he has not fulfilled even his personal requirement to educate his own son. He quotes the Pri Megadim who taught that once a Takonas Chachomim redefines the way we do a Mitzvah D’orayso – that becomes the definition of the mitzvoh, in exclusion of any other interpretation. Such is the working of Torah She’Baal Peh. Subsequent to the Takana, Chazal emphatically taught “any city or town that has not built a community school where everyone is welcome to come learn will ultimately be destroyed and if one lives there they must leave for the world continues to stand only because of the hevel pihem shel bais Rabban. The Nimukei Yosef records a fascinating debate dating back more than a thousand years. Rav Palti Gaon (638C.E.) instituted a penalty for individuals who refused to pay debts that Beis Din imposed. The penalties included a Cherem i.e. he cannot be counted in a Minyan, it is asur to circumcise his son or bury his dead and his children may not attend the school. Ten Centuries later the Maharshal challenged the ruling. He argues that circumcising a son is a fathers obligation and therefore we can refuse to help him. However since the Takana of Yehoshua ben Gamla, it is no longer the father’s responsibility to educate the boy but rather the responsibility of the entire community. By expelling the child from the school we would not be penalizing the father but ourselves! He explained that by depriving this one child of a Torah education the community could G-d forbid suffer unspeakable suffering. Significant to note that this takana was created to educate boys up to the age of Bar Mitzvah. Once they are considered “Gadol” they acquire their own personal obligation to become educated in Torah. . The Chofetz Chaim adds that these days this communal obligation carries over to girls as well as boys because today we can no longer rely on the Mesoras HaEm to teach them what they need to know. If we ask ourselves the difficult question as to why there are relatively so many dropouts from Yeshivah life the hard answer may be the lack of diversity. Yeshivos were set up to all have a virtually identical program with mass produced education. The fact is that children come in all shapes and forms. The lack of diversity per force will cause rejection. In the United States there is a vocational Yeshivah in Lancaster PA headed by Rabbi Yeshaya Sakett. Surrounded by the Pennsylvania Dutch Amish, the Yeshivah has a rigorous Torah schedule. With the help of their Amish neighbors the Yeshivah also creates experts in construction. Someone recently described to me a speech Rabbi Sakett made. He brought with him two pieces of white styrofoam. One was a square peg and the other was a flat piece of Styrofoam with a round hole in it. He said that he would like to prove to his assembled listeners that indeed he can fit a square peg through a round hole. He pushed, twisted, hammered, and chipped his peg and finally got it through the hole. He held up the peg and gleefully proclaimed, “I did it! I got it through! But look at the peg now,” he said, “it’s a mess!” The successful square peg was bent, chipped and weakened. This may be what we are doing to some of our children. In summary: There is a chovas tzibbur – a community obligation. As a community we are obligated to create a community school or at least to make sure that no child is rejected from the best and most professional level of chinuch. Not only is the price of rejection too high but there is a dangerous blemish on a community that does not supply first class education to every child. This is not the responsibility of whoever decided to start a school, of organizations or of Roshei Yeshivah. This is a community obligation. What we need are creative thinkers and doers to work along side of the Gedolei Yisroel and community leaders to create a situation so that no future Hillel is sitting on a cold roof unable to get in. No one is exempt from the pain of being left out in the cold. We must be inclusive and pray to Hashem on this Erev Yom Kippur that He will include us in the Sifran Shel Tzadikim so that we may merit a Gmar Chasima Tova! Rav Aaron Leib Steinman has written a letter for teachers and parents, warning them about improper treatment of students and children. He says that the letter was prompted by the many tragedies and illnesses which have hit the frum community. Many Torah scholars suddenly require yeshuos of one kind or another—children who can’t make a shidduch or aren’t blessed with children, or became seriously ill, etc. They inevitably turn to Rav Steinman and other gedolim for advice and blessings. “The opposite of this is chesed. The merit one can gains from it is immeasurable. The Rosh at the beginning of Peah explains that Hakodesh Baruch Hu especially desires mitzvos that bring good will among mankind more than mitzvos bein adom lakono. “In the past, teachers would teach the student how to learn Torah. They would educate him properly and correct him if they saw he wasn’t behaving as he should. Today, every teacher has to control classes of 40 children, and when they make noise or disturb, he strictly tells him off even to the point of humiliating him. He doesn’t do it to educate the child but to keep order in the class, and to vent his ire on the troublesome student. “People are moreh heter to themselves, such as when a teacher or rav say they have to humiliate someone to ensure discipline. But it’s not that way. We can only do whatever is necessary to prove his point, but not to humiliate another! It’s even more serious when the humiliation is done in public. Last Shabbos, Porat Yosef, our four year old cousin, tragically drowned. His parents, a beautiful young couple, sat Shiva in the city of Hebron, just a few meters away from one of the holiest sites on Earth - the Mearat HaMachpela. I never drove to Hebron before and I have to admit that I was a bit hesitant. With my broken AC in the car I somehow did not feel like the road to Hebron was the right neighborhood to drive around in with the windows rolled down enjoying the summer breeze. The normal way of getting to Hebron is by bullet proof bus but that was an option that I just didn’t have time for. 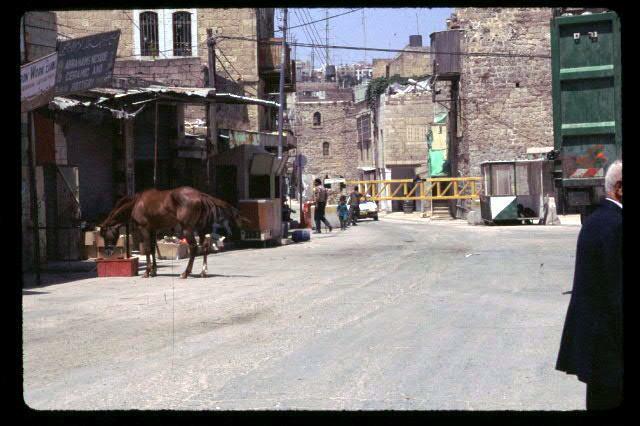 I parked my car on a street that Avrohom Avinu most certainly once parked his donkey. As I looked around I realized that the local press goes out of its way to portray the Jewish inhabitants of this city as political nudniks. A better description might be ‘heroic selfless tzadikim that are willing to do whatever it takes to live according to their beliefs’. Many talk the talk - here lived people that walk the walk. When I walked into the Shiva house something happened. I entered a house full of men and women comforting an obviously very distraught mother and father. As a rabbi I have visited hundreds of Shiva houses, but this was different. The dress, the mood, the discussion, and the look on everyones face transported me to a different time. AsI walked through the wide open door I walked back 2000 years. Somehow the mood and the spirit of all the laws of mourning, which I know all too well, were active in this room. I was humbled to sit amongst what felt like the students of Rebbe Akiva or Rebbe Chananya Ben Tradion. This is what it looked like. An entire community suffered a tragedy. Family and friends were sitting together struggling and stregnthening their faith and their resolve to do whatever it takes to serve Hashem. I’m probably not explaining it well - I guess you had to be there; but I was priveleged to see and experience that there are still Jewish heroes. Fearless heroes for Eretz Yisroel, heroes for Torah and Mitzvos and champions of Jewish communitty! May G-d bless them - and us. I want to be a hero too! We stopped for a few moments to pray at the Mearat HaMachpelah and I thought about how this was once the most coveted piece of land on Earth. Due to the international economic crisis, many highly credentialed and very qualified people that I am in touch with in Israel have recently been laid off. I’d like to try and help the situation by reaching out to my network on their behalf. I am in touch with CPA’s, attorneys, technical writers and many others that may be able to do work for you or someone you know from Israel. I am looking for contacts and creative solutions. If you can help (or if you need help) please contact me. All emails will remain confidential.